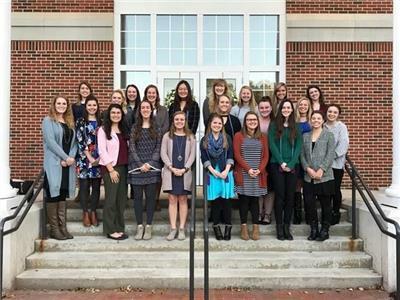 The Lee University Chapter of Kappa Delta Pi, an international honor society for educators, recently recognized local teachers for their demonstration of excellence in the classroom. The ceremony was held in the Helen DeVos College of Education on Lee’s campus. Each year, the KDP highlights educators who have made impactful contributions to both their students and the community. 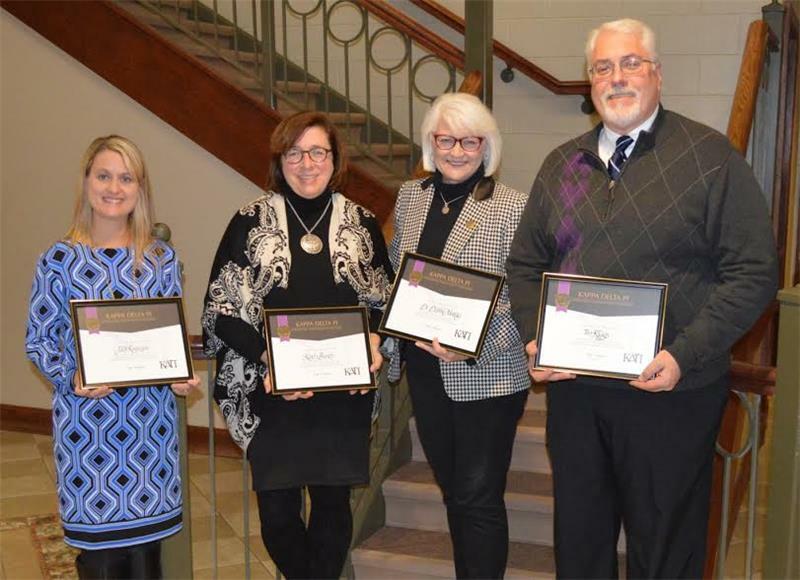 The honorees this year were Karen Bunch, Debbie Murray, Tim Riggs, and Faith Robinson. Ms. Bunch, a special education teacher at Cleveland Middle School, has been in the education field for 34 years. She has previously taught in other schools located in Cleveland, Bradley, and Maryville and at the University of Tennessee at Knoxville. She has been named the Teacher of the Year for Cleveland City Schools. She also has been a Special Olympics coach for 35 years. Ms. Bunch previously served as a board member for Family Life Center, as advisory council for Family Resources Agency, and volunteered at Reinbow Riding. Dr. Murray, who has served in the education field for 42 years, is the vice president for academic affairs and a distinguished professor of education at Lee University. She has also served as the dean for the Helen DeVos College of Education, education department chair, director of graduate studies in education, and as the director of the teacher education program at Lee. While being on Lee’s faculty she has received various awards, including the Kappa Delta Pi Distinguished Educator, Excellence in Advising, and the Distinguished Alumna for the Department of Natural Science and Mathematics. Prior to joining Lee’s faculty, Dr. Murray served in the Bradley County Schools System. Mr. Riggs, the principal at Hopewell Elementary School, has 33 years of experience in education. Prior to serving as principal, he was a physical education teacher. He serves as the president for the Bradley County Principals Association and is on the board of the Cleveland/Bradley County Teachers Federal Credit Union. He received the Teacher of the Year award in 1998. Ms. Robinson currently teaches kindergarten at North Lee Elementary School and has been an educator for 22 years. She has taught at both the elementary and intermediate level in the Bradley County Schools System. Ms. Robinson has been invited to present her strategies on teaching and learning several times for the National Reading Renaissance Conference. She is also a frequent speaker at various teacher workshops. Ms. Robinson is actively involved in the development and implementation of enrichment camps for students in both the United States and abroad. During the ceremony, new students were inducted into the honor society. These students include Julia Adair, Lyndsey Boshers, Brianna Burkhalter, Katelyn Bynum, Maddison Carver, Mikaela Clements, Katherine Coppock, Natalie Eckenroad, Lauren Flatt, Kelsey Fowler, Mary Funk, Sarah Hill, Chloe Hinchcliff, Raychel Moore, Lauren Peters, Brooklyn Phillips, Amanda Raby, Sierra Jung Yun Sim, Lauren Sloan, Macy Stovall, Savannah Taylor, and Mary White. Kappa Delta Pi seeks to encourage high professional, intellectual, and personal standards and to recognize outstanding contributions in education. Founded in 1911, the society became an International Honor Society in Education in 1918. For more information on the honorees or Kappa Delta Pi, contact the Helen DeVos College of Education at 614-8175.